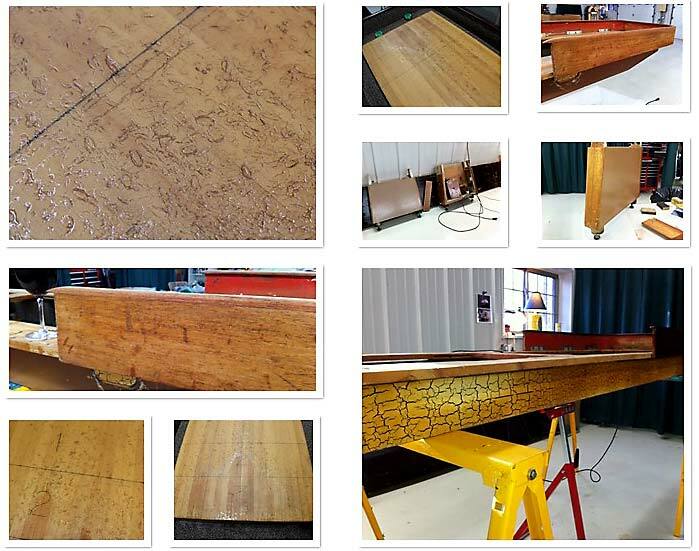 Here are some pictures of William Sidor's refinishing project. 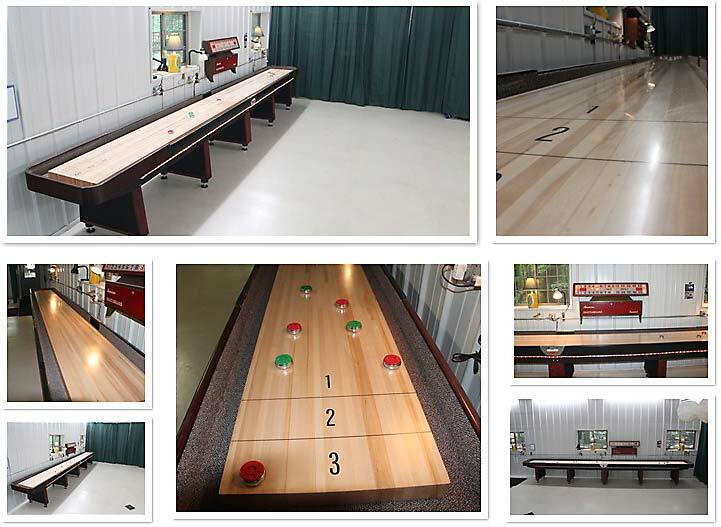 This American Shuffleboard Co. 22 Ft table came to me after many years in public service, complete with battle scars from heavy use and on-the-fly repairs. I am fortunate enough to have a large barn to accomplish refinishing and be its new home. Most parts we already painted over, so restoring to original seemed out of the question and also did not suit my tastes. I decided on a more modern look in dark tones to help cover any remaining scars. The side rails of the cradle were completely sanded to remove prior pain and patched. Cradle after sanding and staining the the horse collars, painting the middle rails and legs, and adding new wood leg trim. Almost all wood parts needed some re-gluing of splitting parts or filling of large chips and dents. No pictures of the old carpet, but here is the new being installed. Playsurface was generally in solid shape excepts for many dents, surface finish chips, and unevenness due to attempted repairs to worn areas. I tried to find a company to replane and refinish the surface, but none exist in my area, so I decided to do it myself. I designed and built a sled for my router to use as a surface plane. 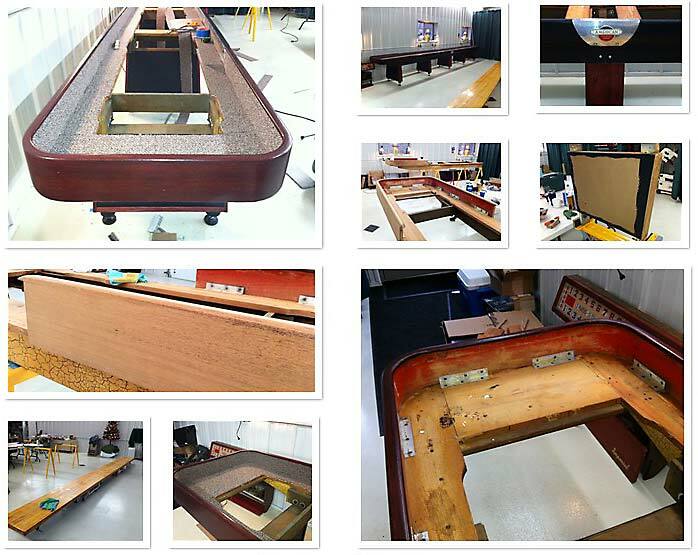 The completed sled is shown resting on temporary side rails carefully positioned and fastened to the playsurface. The vacuum system worked well to keep the chips and dust to almost zero. 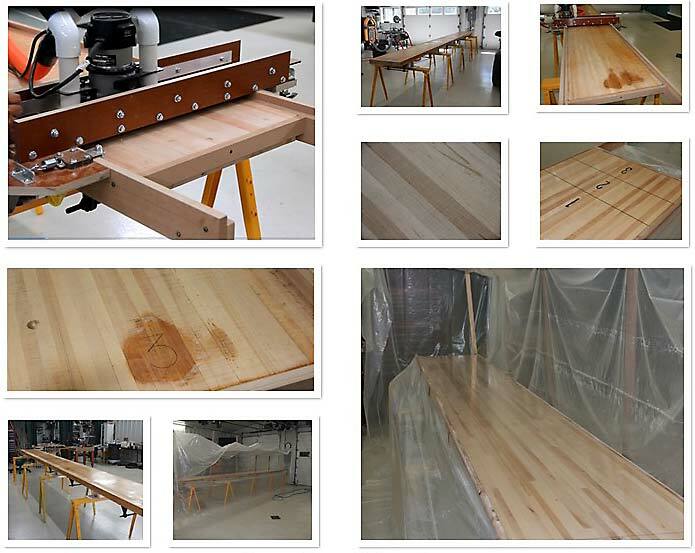 Process is to slide router across the sled, then index down. On the first pass I indexed nearly the diameter of the bit, thus the ridges. On subsequent passes ( I made three in total) I made the steps smaller to minimize the ridges. I removed about one-sixteenth of an inch total to get rid of all the dents, old repair areas and low spots. The remaining ridges were removed easily and quickly with a random orbit sander. I added vinyl transfer numbers and auto pinstriping after two sealer coats of water based poly-acrylic. I used a HVLP sprayer and did not want to deal with solvents. I think I put on about ten coats total to get the surface well above the numbers and lines. Lightly sanded between coats with 600 grit using the random orbit sander.